At Calvary Chapel’s 20-year anniversary Harvest Crusade (8/16/09), Chuck Smith, founder of Calvary Chapel, introduced Rick Warren as “my good friend who pastors Saddleback Church” and asked him to lead in prayer (see transcript of prayer at end of post). The teachings and positions of Rick Warren have come into conflict with us at Calvary Chapel. Pastor Chuck has directed us to discontinue this product [Purpose Driven Life] effective immediately. So what has happened behind the scenes in the last 3 years? Apparently, a lot. The fact that Smith can say “my good friend” in public ministry after stating that his good friend’s teachings are in conflict with Smith’s beliefs, is extremely suspicious. I am not a Calvary Chapel member, but I would never trust anyone who does such an obvious spiritual back-flip. Caller’s (John’s) Question: Should pastors share a platform at an evangelical event with someone who typifies the Emergent Church, a minister? Smith: [chuckle] That’s difficult, John, because, you know, you might say in a sense that last night I was on the platform with a minister that they say that he is a part of the Emergent Church, that he has, you know, sort of a different emphasis in his ministry, more of a social emphasis on what the church should be doing socially for people rather than the spiritual emphasis, and so I was on the platform with him but, you know, I think that it would be divisive. Now the man, I’m convinced, loves the Lord, has a large church, and is, you know, feels that he is called of God to really deal with the social problems of our world today. Now it could be that God IS calling him to that, but that isn’t why God has called ME to do and so, but I can still look at him as a brother in Christ – he believes that Jesus died for our sins and he just has a different emphsis as far as what he feels should be the priority of the church today..
We were both invited to be there but we were on the platform together, sat next to each other, and he is a brother in Christ, and so I didn’t really have any real problem with sharing, being on the same program together with him. According to scripture, the spiritual emphasis is everything. There isn’t a secondary “emphasis” that someone can pick and choose to focus on. Warren is apostate and unfortunately Smith won’t call him on it because he doesn’t want to be “divisive”. Father, I want to thank You that every person here tonight is here because You wanted them to be here, because You never made a person You didn’t love, You never made a person You didn’t have a purpose for, You never made a person that Jesus didn’t die for. And I ask You tonight every person here will see a clear picture of Jesus, what He can do in their lives. Father, there are people here tonight who are confused. Would You help them realize that Jesus is the Truth. And I’m sure there are many people here tonight that feel guilty and ashamed, maybe about their past. Help them to experience the freedom of forgiveness so they can start over with You, a new life. Lord, we know that there are probably some people who have a tough week, or a tough month, or a tough life, or maybe they’ve been out of work for six months and they’re feeling discouraged and depressed. I ask You to help them to experience the joy of salvation. Lord, there are other people here who are worried and are anxious and are stressed out about the future and about their job. Help them to discover the peace that passes all understanding. And Father, tonight all of us who know you and are Your children we pray that there will not be a single person exiting this stadium tonight that doesn’t know You. Thank You that You know everything about us and You still love us. And our prayer is that every one of them here tonight who don’t know You will accept You into their heart. Jesus, only You can make the changes that we want to see in our lives. Only You can restore our loneliness and relieve it and heal our past. Only You can give meaning and purpose and only You can give us a home in heaven. So Father, I ask that You speak through Greg again tonight as You have every night for 20 years. Speak through him with clarity, with simplicity and with power. Anoint his words so that they’re like arrows piercing our hearts all the way into the furthest seats. We thank You in advance what You’re going to do in lives tonight. In Jesus’ Name, amen. …and we were birthing a new church. But we would watch you on television and we’d be inspired. I always loved Romans 12:2, “Be transformed by the renewing of your mind” because I knew I had to change my thinking as well as my relationship with God. 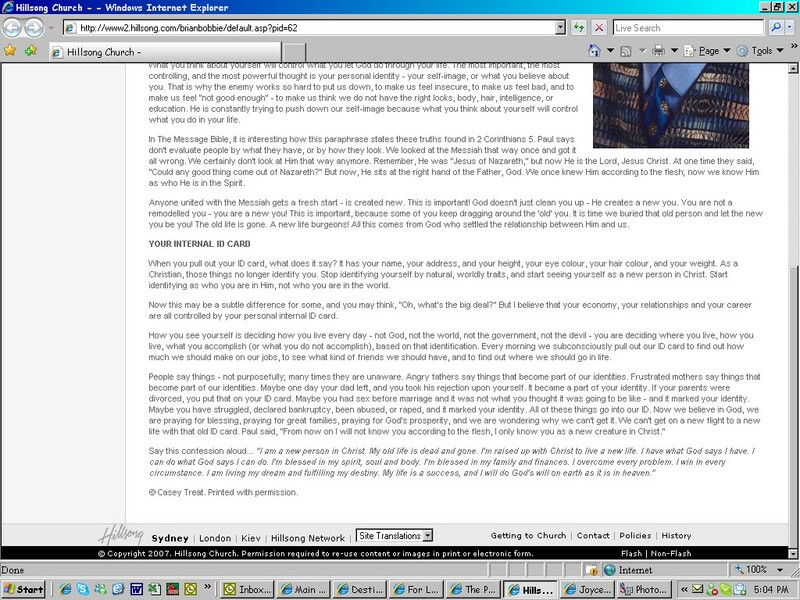 So I would see you, hear about possibility thinking, if they can do it at Crystal Cathedral we can do it in Seattle. A few months ago, we moved into a 5,000 seat sanctuary. Schuller’s ministry has been based since 1969 on “Self-Esteem Theology”, a belief he wrote about in his books. Jesus died to alleviate low self-esteem; the preaching of sin is “a polluted message of shame, humiliation, and undeserved embarrassment” (Prayer: My Soul’s Adventure with God, p. 45, Published by T. Nelson 1995). But Jesus did not die on the cross to ELEVATE SELF. Jesus made it very clear that we must DENY SELF, pick up our cross and follow Him. Treat has built his theology and church on “possibility thinking”, the very cornerstone of the self-esteem theologists. This belief is mimicked in the Word/Faith movement and Prosperity Gospel of which Treat is very much a part. Build up self, feel better about self, make more money for self, and above all — give more money to the church. The “possibility thinking” along with the Prosperity Gospel is based on the love of money which is the root of all evil (1st Timothy 6:10). 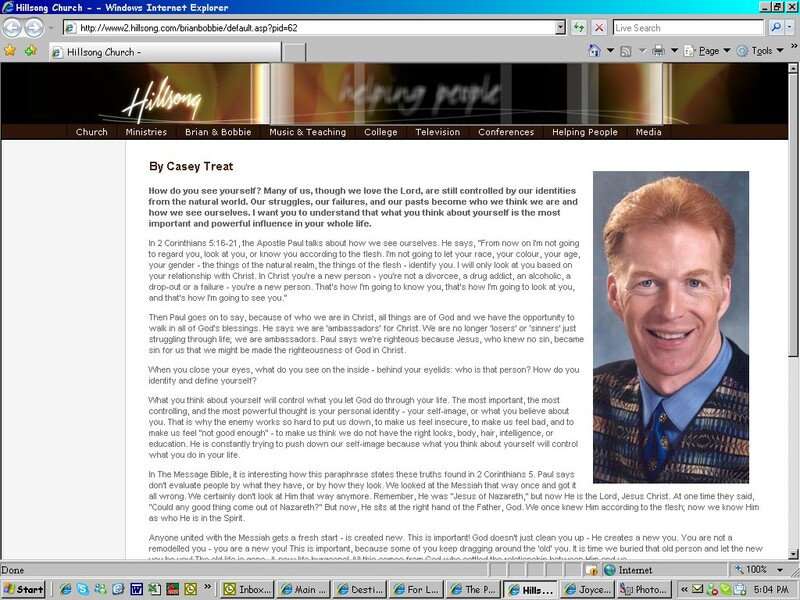 Casey Treat’s name is prominently displayed on the Crystal Cathedral website. In fact they also sell his latest book How to Be Your Best When You Feel Your Worst, since his teachings fall in step with Schuller’s heretical theology. If Treat was actually preaching/teaching the “polluted message” of sin and repentance, his book would not be found on Schuller’s site. Treat, along with his wife Wendy, have been pushing contemplative spirituality advocates (John Eldredge, M. Scott Peck, etc. see previous article), the Prosperity Gospel, possibility thinking with the self-esteem theology — all of which are directly contrary to the Word of God. In his latest book How To Be Your Best When You Feel Your Worst, Treat writes of his experience with battling Hepatitis C from which he has now recovered. He uses his experences to encourage others to find help, through his five steps, with depression, marriage issues, health problems, financial struggles, stress, etc. Unfortunately he teaches that low self-esteem and low self-image is at the root of the “problems”.